We have done clean installation of Windows XP so many time using Windows XP CD/Disk but what people will do without having CD/Rom in their small Notebook or their PC's Rom either damaged and corrupted, which means it's no more usable to read disc. One another issue while using Windows CD during installation is minor scratches on CD which will not complete installation or give you error anytime during installation due to unreadable of a single Windows file. There are lots of reasons behind this and installing Windows XP from USB Flash drive is far better and faster than Windows Disc. 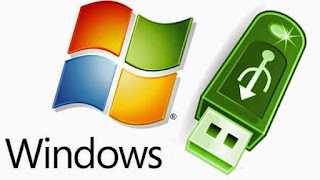 Therefore, this tutorial is being shared with people for making or converting their USB flash disk into Windows XP with some of simple and quick steps. Yes, you can make your USB as Windows XP Disc to install Windows from it with faster. So get prepared for making your USB drive into Windows Disc and don't worry you can format USB any time to remove Windows Disc from it and make it for general use without any issue. Credit goes to Nelda Yuntantri @ Komku. 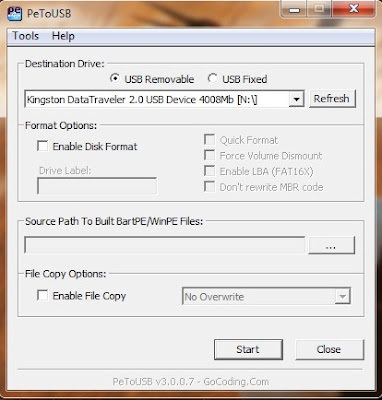 Watch and follow this Video tutorial for creating Windows XP bootable USB Drive. 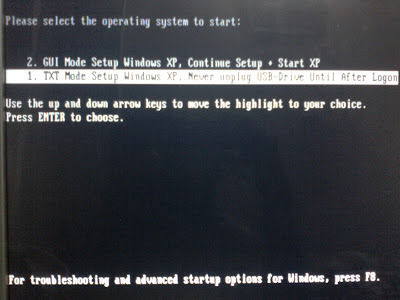 After burning the Windows XP setup into USB/Flash Drive, you have to setup boot option for Flash/USB HDD as 1st so that your USB starting booting. 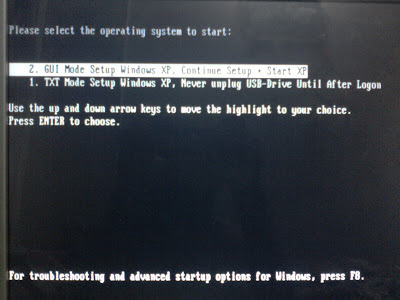 (Note: some older PCs do not have USB Booting option in their Bios Setup). Tips: For Dell Users Press "F12" Key and for HP Users Press "F9" to boot USB quickly. When your system detect the USB/Flash Drive & start booting, then select first option "1. 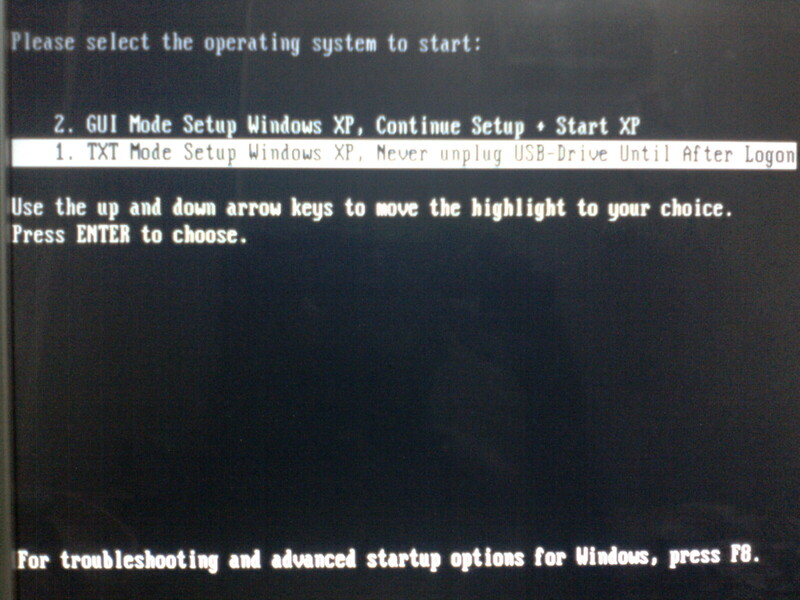 TXT Mode Setup Windows XP, Never unplug USB-Drive Until After Logon". After first restart of your system & the same screen come again, then now you have to select second option "2. 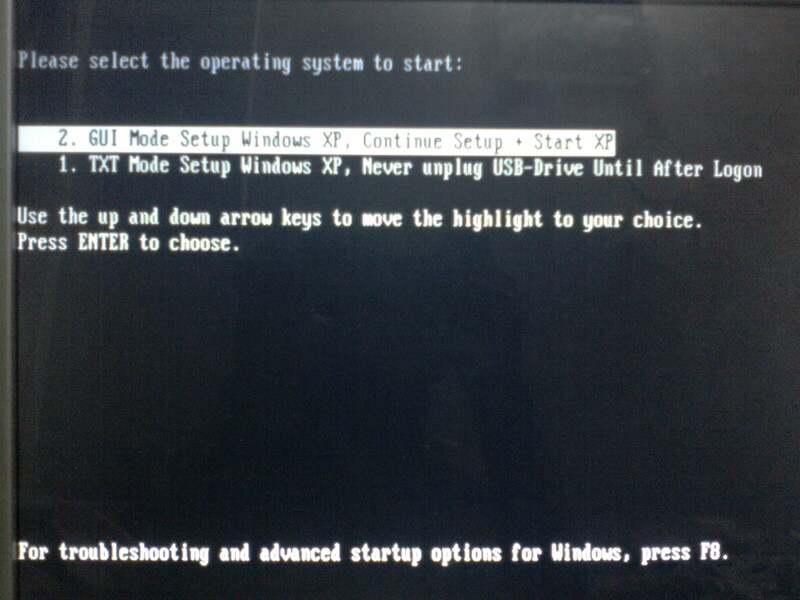 GUI Mode Setup Windows XP, Continue Setup + Start XP" & proceed the setup & install it.